How Can Do Not Call List Registry Check 5 © Help? On September 1, 2003, the Federal Trade Commission (FTC) put online a national list of consumers’ phone numbers who wished to not be called by telemarketers. Starting October 1, 2003, the FTC, the Federal Communications Commission (FCC) and local agencies began to enforce compliance with the list. The provision mandates that no telemarketer may call a phone number on the list, with exception to political organizations, charities, telephone surveyors, or companies with which a consumer has an existing business relationship. Violations can be costly: up to $40,654 per violation! To find out more about the Do Not Call List, please visit the FTC's Do Not Call List FAQ. Do Not Call List Registry Check 5 © can play a major role in keeping an organization protected under the “Safe Harbor” clause. Do Not Call Lists are provided by the Federal Trade Commission, and can be obtained at https://telemarketing.donotcall.gov. You don’t have to bookmark this webpage, a link to the website is provided in the application. The Canadian National Do Not Call List is provided by the Canadian Radio-television and Telecommunications Commission at https://www.lnnte-dncl.gc.ca/ind/accueil-home-eng. Do Not Call List Registry Check © needs hard drive space to store Do Not Call records. The first time you run Do Not Call List Registry Check © you will be asked to provide a file path for the application to store its records in. If you are unsure of what to do, you can leave the default settings. The share must provide read/write privileges to all users that will be maintaining Do Not Call lists. Do Not Call List Registry Check © is not a server product; it is not designed to be used by a large number of people at the same time. Businesses with such requirements (e.g. large call centers) should inquire about our upcoming server product. Before we can do any searching or list scrubbing, we must import Do Not Call Lists into the database. Currently, the FTC requires that organizations update their databases at least once every 31 days, so this is a screen the user will be seeing at least once a month. To access the Maintenance menu, click the “DNC List Maintenance” tab. 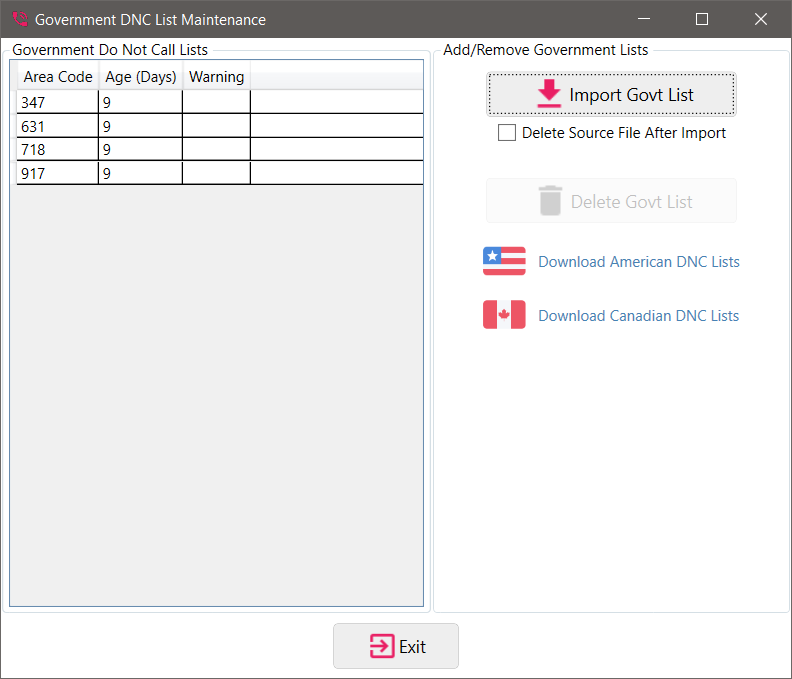 The List Maintenance Menu provides two options; one can select to maintain Government Do Not Call Lists or to maintain Custom/Company Do Not Call Lists. Government DNC Lists are provided by government agencies, such as the FTC. Company DNC Lists are created either in-house or by a third party vendor. A government list is any list released by a Federal, State, or Local entity. Most lists conform to the FTC standards and should be “Importable” by this application. 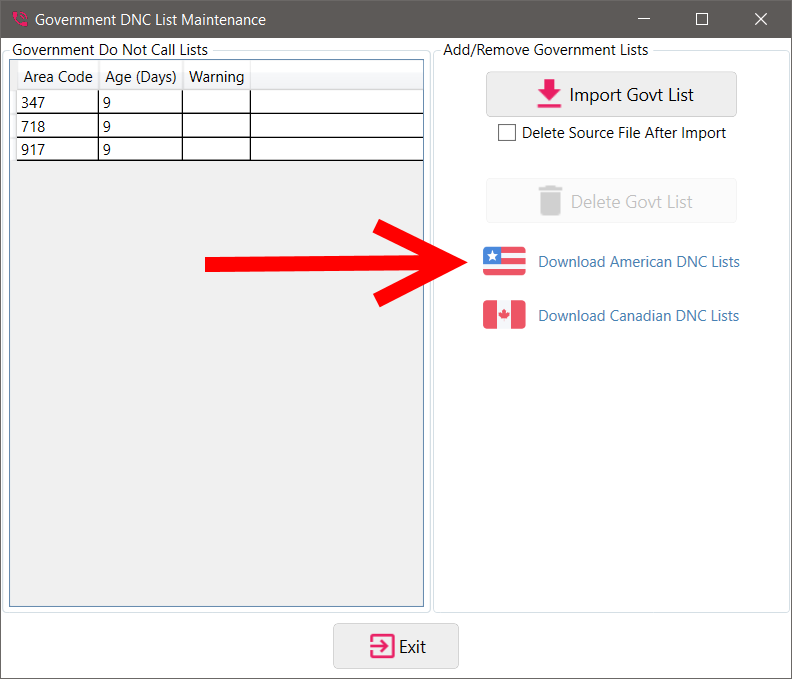 To import a Government list click the”Govt DNC Lists” button in the DNC List Maintenance tab. You will be brought to the “Government DNC List Maintenance screen. To the left is a grid that displays which area code lists are currently in the system, along with the age of each list (in days). The FTC mandates that a list can be no older than 31 days. Before you can import lists, you must obtain them from the FTC website. You can always visit the FTC site through the application by clicking “Download American DNC Lists” (or the Canadian counterpart) hyperlink in this screen. 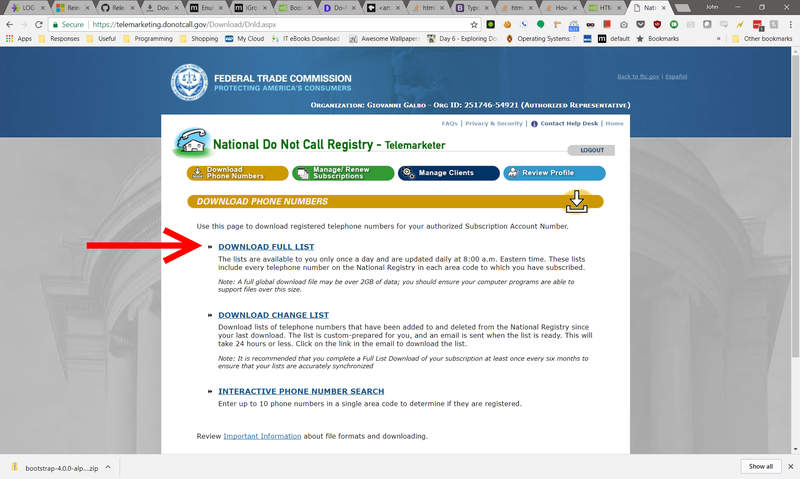 Figure 3 - Click "Download DNC Lists" to obtain Do Not Call Lists from the FTC. 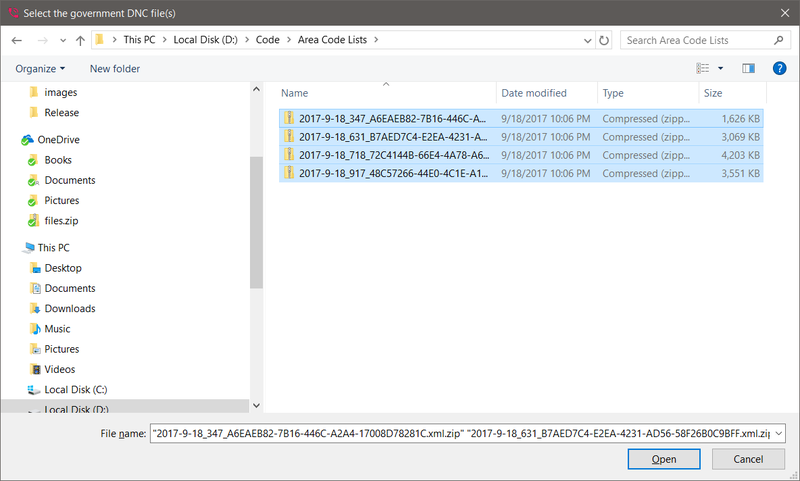 Figure 4 - After logging into ww.donotcall.gov, click "Download Full List"
The next screen will present you with an option of downloading either Flat Text File or XML Tagged File. You can select either; though we recommend the Flat Text File option because it will be downloaded slightly quicker and it will be processed more quickly as well. After clicking “Begin” you will be brought to a new screen presenting all of the area code lists (and state lists) that you have subscribed to. Download all of the lists that you need. The files downloaded will be compressed. You do not have to uncompress the files; the application will automatically uncompress the zipped files. The user should note that multiple files can selected at once if she holds the control key down while selecting files. After clicking OK, it may take a few minutes to process all of the files (after all, each of them may contain a million or more listings!). A message reminding you that processing is occurring will appear until processing completes. A pop up status screen will inform you when the import is complete. You should review the contents of the status message to ensure that all of the selected lists were successfully imported. Any errors that may have occurred while importing will be visible in this screen. The table should now be populated with one or more area codes imported. The user can enter DNC phone numbers into the system and also import DNC phone numbers from company DNC contact lists. To access the Custom Company Do Not Call List screen, click “Company DNC Lists” in the DNC List Maintenance Tab. 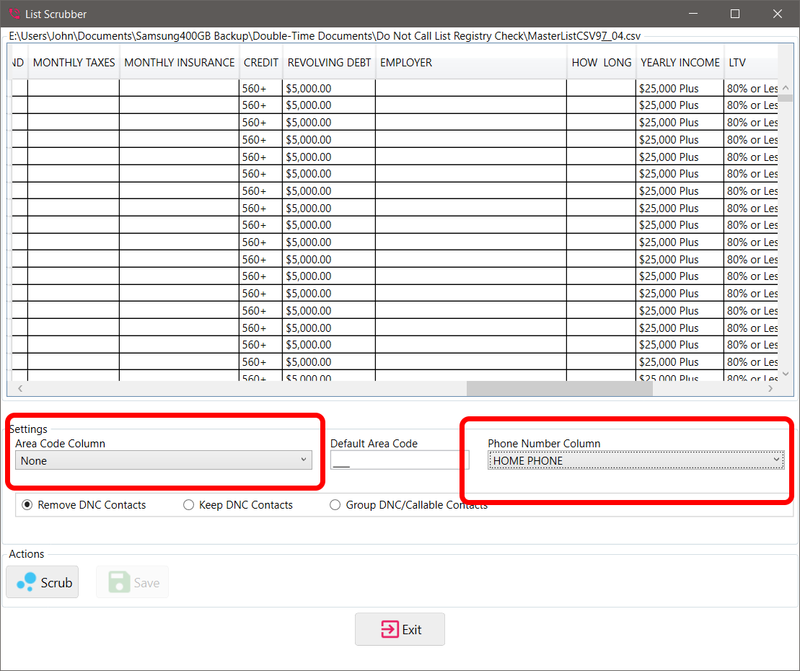 Figure 9 - To add individual phone numbers to the custom DNC List, enter the 10 digit number and then click "Add"
To import custom Do Not Call lists click “Import Custom List.” You will be prompted to select a file. Select the file that contains your company’s Do Not Call information (if this information is kept in multiple files then these steps will have to be repeated for each of the files). If you select an Excel file with multiple spreadsheets you will be asked to select appropriate spreadsheet. If you select an access database file (mdb) you will be presented with the MDB Wizard. Please see the “MDB Wizard” section of this document for more information. After selecting a file you will be in the Custom DNC List Importer screen. The first 10 records of the file selected will be displayed. The application will attempt to automatically select the appropriate area code column (if there is one) and phone number column. Please ensure that they are correct; if they are not then select the appropriate column headers from the drop down lists. You may also specify a “default area code.” Whenever a phone number without an area code is encountered, the application will assume that it is part of the default area code. After making your selections click the “Import” button. 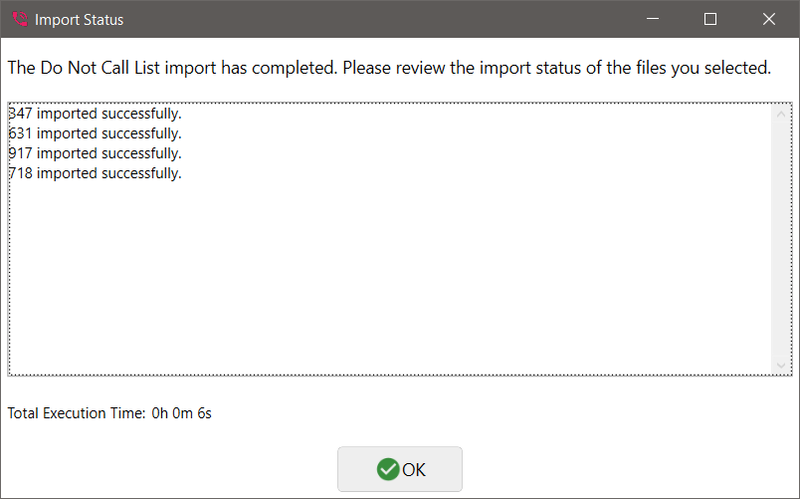 The import process can take a few minutes, depending on the size of the file. 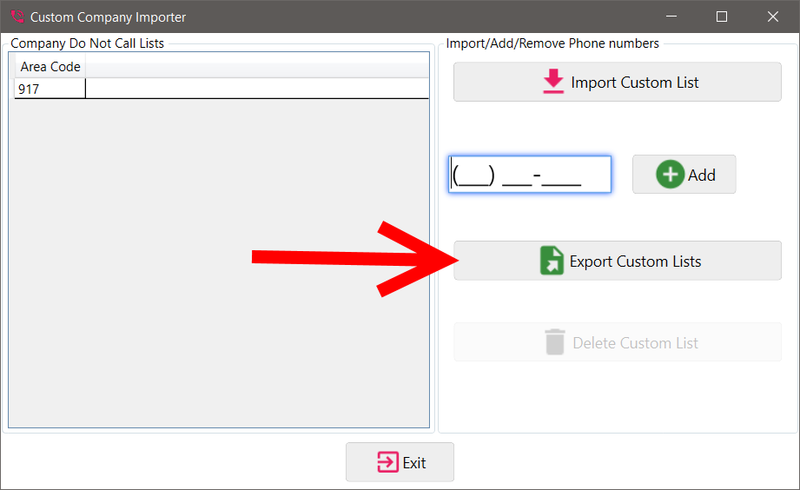 To export all of the company’s custom Do Not Call List phone numbers, click the “Export” button. If a government list for that area code is available, its age will be given (in days). To “scrub” a contact list, select the “Scrub List” tab. Click the button to the left of the text box (with the picture of a folder on it) to select the contact list you wish to scrub. The contact list can be in .CSV (or .TXT) (text delimited file), .XLS (older excel format ), .XLSX (Excel 2007+), .MDB (older Access database format)), or .ACCDB (Access 2007+). Click the “Scrub” button after selecting a file. If the file is in the Excel format and it contains more than one spreadsheet, you will be asked to select the sheet that you would like scrubbed. 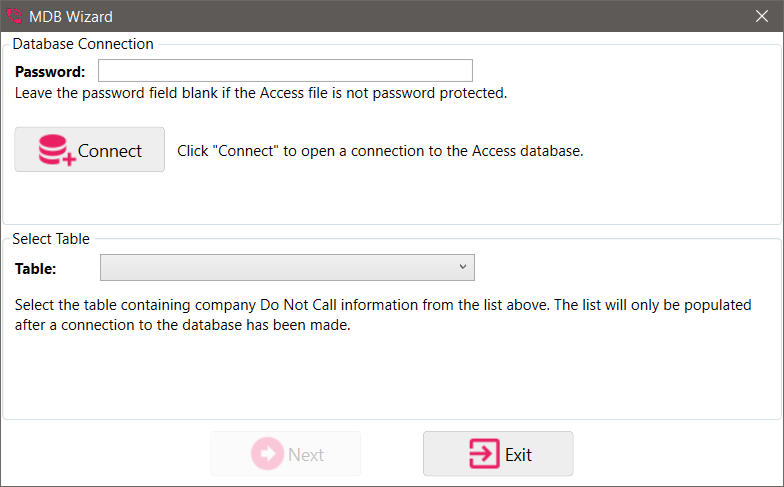 Please see the section titled “MDB Wizard” for more information on how to connect to an Access database and how to select a table from within the database. The Scrub screen has a large table with a set of options at the bottom of the screen. The table should be filled with the contents of the selected file. The application needs to know which columns hold the area code (optional) and phone number. The application will attempt to automatically select the appropriate area code column (if there is one) and phone number column. Please ensure that they are correct; if they are not then select the appropriate column headers from the drop down lists. A default area code text field is provided so that a phone number without an area code will default to whatever is entered into this area. Finally, the user should click “Scrub” to process the list. This can take several minutes, depending on the size of the file. Once all options have been selected, click “Scrub.” A Statistics Screen will appear when scrubbing is complete. To save changes, click “Save”. The application periodically checks for expired government lists. If an expired list is found, the “Maintain Lists” icon will turn into a red "thumvs down", and remain red until there are no expired lists in the system. When working with MDB or ACCDB (Access Database) files, you will be presented with the MDB Wizard. Working with the wizard is a two step approach. First, you must connect to the database. If your database is password protected, enter your password in the password field, otherwise leave it blank. Click “Connect” to open a connection to the database. Once a connection is made, select the appropriate table from the drop down list. Finally, click “Next” to exit the Wizard. 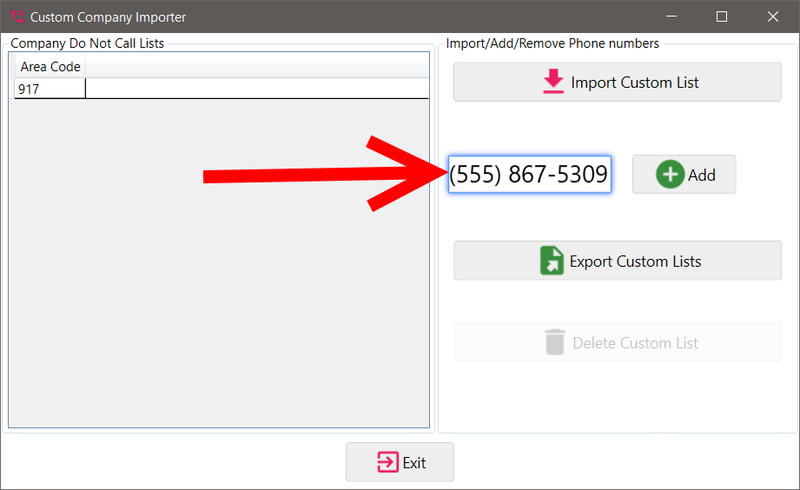 To view a history of phone number imports (both Government and Custom) or a history of contact list “Scrubs”, select “Reports” from the main menu and then select the appropriate option. The report that is generated can be saved as a comma delimited file (CSV) so that it can be viewed in spreadsheet programs such as Microsoft Excel. Depending on usage, over time Log Reports may grow large. A log report can be cleared by clicking the “Clear Log” button. It is highly recommended that the log is exported before clearing the log because data lost after clearing the log is not recoverable.